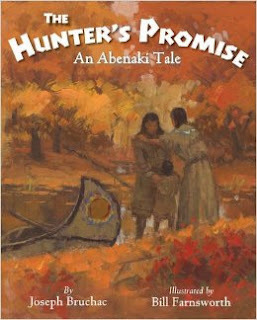 Editor's Note: Beverly Slapin submitted this review essay of Joseph Bruchac's The Hunter's Promise. It may not be used elsewhere without her written permission. All rights reserved. Copyright 2016. Slapin is currently the publisher/editor of De Colores: The Raza Experience in Books for Children. Without didacticism or stated “morals,” Indigenous traditional stories often portray some of the Original Instructions given by the Creator, and children (and other listeners as well), depending on their own levels of understanding, may slowly come to know the stories and their embedded lessons. Bruchac’s own retelling of the “Moose Wife” story, traditionally told by the Wabanaki and Haudenosaunee peoples of what is now known as the Northeastern US and Canada, is a deep story that maintains its important teaching elements in this accessible children’s picture book. As the story continues, young readers will intuit some things that may not make “sense.” Why does the hunter travel alone to and from winter camp? Why doesn’t the woman return with the hunter to the village? Why do their children grow up so quickly? Why does she ask only that the hunter promise to remember her? Who is she really? The story’s end is deeply satisfying and will evoke questions and answers, as well as ideas about how this old story may have connections to contemporary issues involving respect for all life. Farnsworth’s heavily saturated oil paintings, with fall settings on a palette of mostly oranges and browns; and winter settings in mostly blues and whites, evoke the seasons in the forested mountains and closely follow Bruchac’s narrative. Cultural details of housing, weapons, transportation and clothing are also well done. The canoes, for instance, are accurately built (with the outside of the birch bark on the inside); and the women’s clothing display designs of quillwork and shell rather than beadwork (which would have been the mark of a later time). That having been said, it would have been helpful to see representations of individual characteristics and emotion in facial expressions here. While Farnsworth’s illustrations aptly convey the “long ago” in Bruchac’s tale, this lack of delineation evokes an eerie, ghost-like presence that may create an unnecessary distance between young readers and the Indian characters. Bruchac’s narrative is circular, a technique that might be unfamiliar with some young listeners and readers who will initially interpret the story literally as something “only” about loyalty and trust in human familial relationships; how these ethics encompass the kinship of humans to all things in the natural world might come at another time. I would encourage classroom teachers, librarians and other adults who work with young people to allow them to sit with this story. They’ll probably “get” it—if not at the first reading, then later on. It’s long been understood among the Wabanaki…that a bond exists between the hunter and those animals whose lives he must take for his people to survive. It is more than just the relationship between predator and prey. When the animal people give themselves to us, we must take only what we need and return thanks to their spirits. Otherwise, the balance will be broken. Everything suffers when human beings fail to show respect for the great family of life.